The DS32KHZ TCXO circuit board is intended to allow the experimenter to easily use the Dallas/Maxim DS32KHZ TCXO chip. This is NOT a kit, merely a circuit board. The reason for not including the DS32KHZ TCXO chip is that they are quite expensive in small quantites. The DS32KHZ operates at 32.768 kHz and is very accurate compared to regular watch crystal circuits. 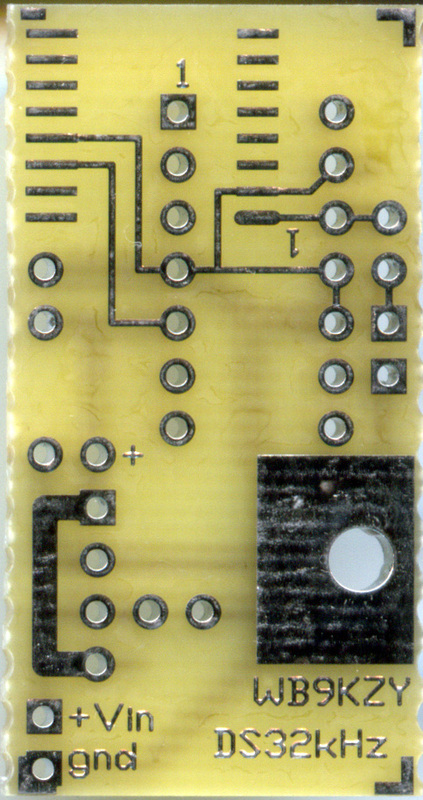 The experimenter would use this board to drive another project such as a digital clock where a more accurate oscillator is needed. For example, I've used a prototype version of this board to drive the clock in the Elecraft K2 KAF2 kit where it gains less than 1 second per week. Minimal documentation is included, the experimenter should be able to build/apply the board easily using the Dallas/Maxim datasheet . Documentation for DS32KHZ board: download (Right click/save target as) and print the Schematic + Parts placement diagram , in Adobe Acrobat (.pdf) format or text file.